The Founder, Matthew Coley, is up next on our blog. This is where it all started. What was initially only a thought became a reality with Heartland Marimba under the direction of Matthew. It is exciting to see the continuation of this massive project that was initially a week-long academy in the summer, congregating students from all over the United States. Throughout the year HMQuartet and HMCollective perform seasonal tours to give communities an opportunity to see the true elegance and intensity of the marimba. These performances show off many genres of music in a flurry of mallets. To see a taste of the impressive career Matthew has made, be sure to check out this site but also Matthew's personal site, http://www.hearmatthewcoley.com for much, much more. How did you get started with the idea of HM? MC: Heartland Marimba started as a nugget of an idea back in 2010 or so...but I had no idea at all that it would entail something so encompassing as it has become today. 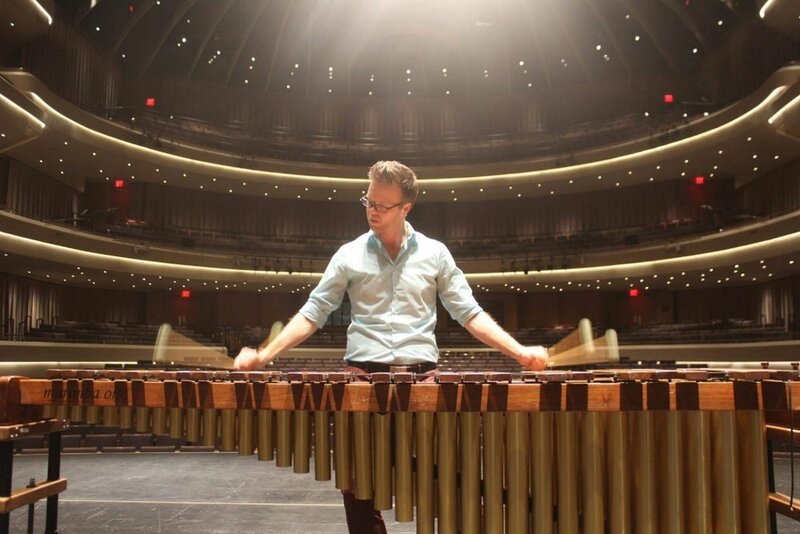 As I was starting a job teaching percussion at Iowa State University, finishing my doctorate at Northwestern U, and traveling back and forth from Chicago and elsewhere for gigs, I kept thinking it would be nice to create something close to home that was a total immersion for students and professionals into the classical marimba arts. But also, I've always had this desire to create a nonprofit organization from the ground up that had staying power for decades to come. This comes from my time working in the dance scene in Chicago as a musician, but also, dare I say, as a dancer. The modern dance-makers in Chicago, and the nation for that matter, are some of the hardest working, creative people I've encountered. They build everything from the ground up. They start companies (nonprofits), produce shows, choreograph the show, dance in it, collaborate for it, promote it, fund-raise for it, everything. It's amazing to be a part of something like that. So it is innate to my core now. If I have an idea, I don't sit on it, I jump up and start working it out, and get the thing in motion. Fresh out of a graduate degree in 2004, I started Sonic Inertia, a multi-media, collaborative ensemble that did projects until about 2009. After finishing another graduate degree in 2013, the first HM Festival and Workshop happened in 2014 at ISU. Our guest composer Steve Simpson said to me at that point, "I want to be back as the guest composer in 2024, because this thing is going to be huge!" And there you have it, the monster was born. I originally thought, I guess, that HM would just be a week in the summer, but I feel like after that first one the gears went into full throttle. I have lots of ideas, the trick is to filter them so as to produce a lasting foundation to build on. Otherwise, it can burn out too quickly. So, here we go! I'm fully committed and excited to see this idea through its many iterations and into full realization. What has been your favorite part of this marimba journey? MC: There are two things here. First, I would say the connections I've been able to make with other artists, composers, and students. Performing with others and working closely with composers and others that like to see big ideas into fruition is so rewarding. Secondly, and not always immediately realized, is the limitless possibilities that are available for creativity. As I get older, and continue to improve as a performer/ creator, it is so cool to see what vast space there is still to explore. I've been thinking about this a lot lately. The more things I take on and attempt, each time I think, oh yeah!, I've done it now, and then after some separation, I realize, nope!, there's just so much more out there I still don't know. That's sobering and fun! What challenges have there been for you and the rest of the organization? MC: Where to begin here. There are innumerable challenges for artists these days...especially self-starting, contemporary artists. The first being how to view success. Remember, we're talking about marimba here, so success is defined very differently than other creative fields that are just more familiar to the general masses. The path is still being paved, so at least we can take comfort in that. The biggest challenge for me is the daily struggle of balancing all the new things I want to tackle with following through on the more secure things for the time being. As an artist I need to continue to explore and create, which takes time, but often patience is not such a plentiful thing for me, and of course we have to survive on a basic societal level; i.e. bills, health, relationships, etc. So basically, striking a balance between real life and the desire to always create, along with being patient are probably my biggest personal struggles. As far as HM, it goes hand in hand with what I just said, I want it to be so many things so quickly, but I have to check myself and strategically build it. The other HMQ members can probably attest to this! I've got lots of plans but every organization has to make sure many other foundational things are in place first to continue to add bigger ideas on top. We're still looking for that ridiculously wealthy benefactor to set us free on our ideas! What advice might you have for young players whether they are going into a musical career or not? MC: Worry about what you are creating right now, the other stuff will come. Serve the art and the community you are wanting to affect first and foremost, the rest is just ancillary. It's a long, long journey through years and years of study, practice, observation, and experimentation, and repeating those over and over, and you should enjoy this time. I'm still learning a lot every day. And the more I learn, the more I learn that I still need to learn. It's true. MC: Ever since about 1998 (...maybe '97) when I started tackling fugues on marimba, I've been enamored with exploring the contrapuntal possibilities and performing this genre of music on the instrument. I've had several composers write fugues for me and have written some of my own. One of them, Bjorn Berkhout, once said to me, "The fugue was the last great contribution to Western-classical music." So, I am on a huge Bach high right now and am currently working on a WTC-II project. I go in and out of performing this music. It is so mentally demanding to perform fugues that I have to take breaks when other things in life and career come up. The first big release of this project is scheduled for winter of 2017/18. Outside of music, what are some things you like to do? MC: Well, I try to run and bike as much as I can. Traveling is something I like to do, but seems to be mainly the result of doing music and less about traveling for leisure these days. Although, I got to spend two weeks in Paris this spring! Lately, everything has been focused on music/ career...it's not as sad as it sounds, I love it! I'm trying to create an organization that can fully support five performers down the road and substantially make an impact in many communities and within the percussion world, so that combined with solo activities doesn't leave much time for other things. Usually by the end of the day, my partner (Korey) and I cook something together and choose some Netflix show to indulge in! What long-term goals do you have for HM? MC: I basically eluded to this in the previous question, but I/ we are working to positively affect communities, performers, and students in a multitude of meaningful ways. The Academy will continue as the HMFestival in 2018 with the other members of the HMQuartet at the helm for this upcoming season. This is very exciting for me, as I get to focus on other aspects of building the organization and I can just concentrate on performing and teaching next summer at the Festival! In the 2016-17 season, HMQ was together for a total of 23 days for rehearsals and performances. This season we're together for about 60 days! We intend to continue that increase in future seasons. We've got plans for launching free after-school/ summer elementary music workshops for underserved communities in the future. The HMCollective, soon to be announced as the HMEnsemble, will be back for a summer tour in 2018! We're gearing up for some cool educational projects with new commissions through some grant funding we've received for HMQ. And soon, we hope to be able to hire someone to help manage HMPublications and other operations. Plans are big, and with five directors (HMQ) working towards these goals the future is very bright (...and rosewoody...[? ])!